The big, broad meadows along Slough Creek attract a variety of wildlife, and pop in early summer with wildflowers. The creek is also a favorite among fly fishermen. 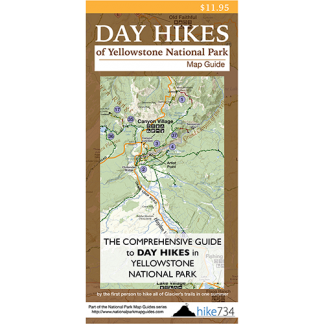 The hike to the first meadow follows along a dirt road used by a park concessionaire’s horse-drawn wagons. It climbs up and over a ridge amongst an old burn. At the top of the ridge you pass a few marshy areas. Follow the road down through a mature forest to the meadow with Slough Creek snaking through it. Further along the road, an old cabin and barn look over the meadow. Sandhill cranes and bison are frequent visitors to this area. Turn this into a longer, 9.6mi/15.4km hike by continuing on to the second meadow. 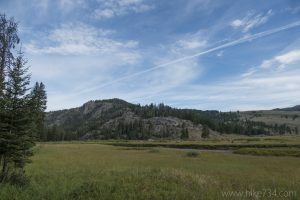 The first meadow gives way to a forested area for about 1.5mi/2.4km, then opens back up to this much longer second meadow that features similar lazy creek meanderings through open meadows. Trailhead: Take the signed dirt road for Slough Creek Campground located off of the Northeast Entrance Road east of Tower Junction. The trailhead is a signed and gated dirt road located at the pit toilet before the campground.